We left Copenhagen with calm seas and no wind, so we motored down the Sund, over the tunnel that (along with a bridge) joins Denmark and Sweden. 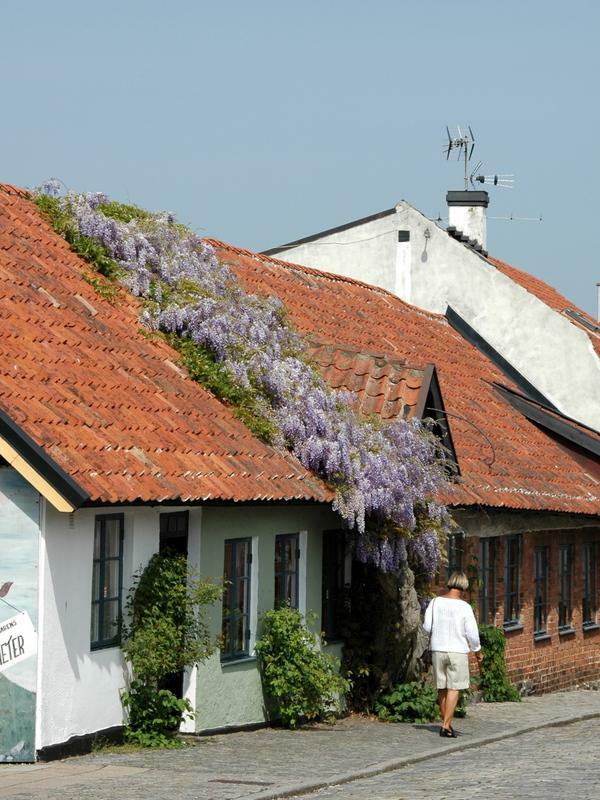 We took the Falsterbo Canal that slices through the SW tail of Sweden, saving us about 6 miles. 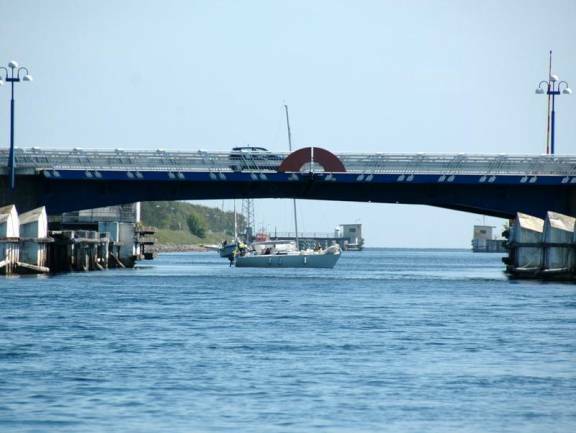 The buoyed channel leading up to the canal is more than twice as long as the canal itself, and must be followed. We tried to time our approach to coincide with the one bridge opening. The canal used to have a lock as well as an opening bridge. They have removed the lock, since the current is not too strong (about 2 knots the day we went through). Once through the canal we had great wind for a sail along the south coast of Sweden. 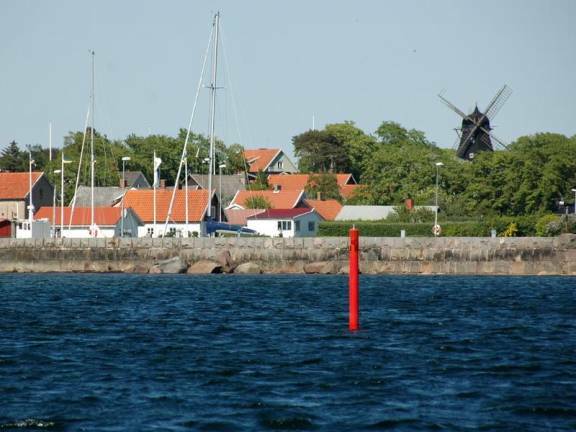 The wind petered out after dinner so our overnight passage was by motor to Simrishamn, the southern-most harbour of any size on the SE coast. Unfortunately the great sailing weather was over for several weeks. 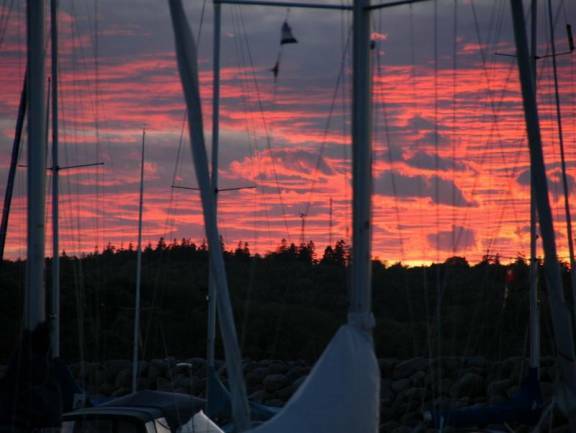 We stayed in Simrishamn 4 days waiting our a westerly gale. The delay meant we attended the local sailing club Friday night BBQ, and exchanged a National Yacht Club burgee with them. Leaving Simrishamn was a bit tricky. The bay to the NE is called “Little Biscay” because it has a reputation of bad wind and seas, and there are no ports (marinas or anchorages) for 30 miles. We left at 4AM (yes, it had been light for about half an hour) with 20 knots of wind from the NE (yes, we were heading northeast). The first three hours we both wondered why we did not stay one more day at Simrishamn. The waves were steep and drenched everything with saltwater. 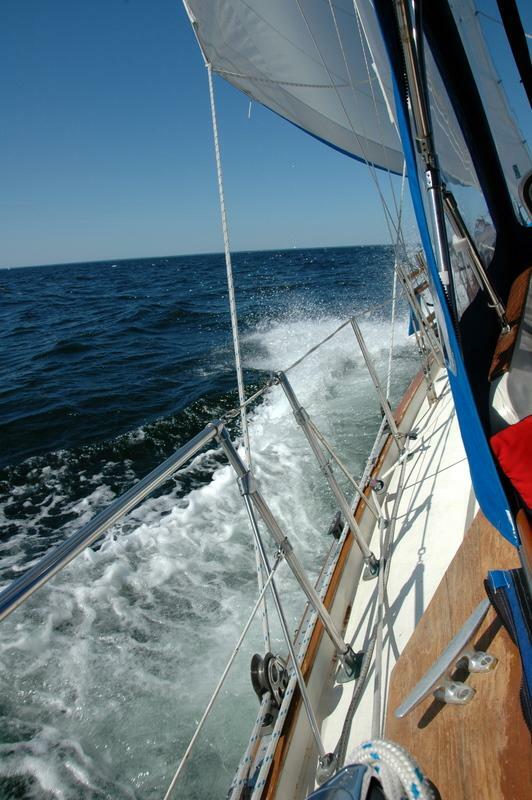 The wind was on the nose, so we motor-sailed with the mainsail and a bit of unfurled Genoa. We decided our best tactic was to stay close to shore, which offered a bit of protection from the waves. By 11:00 we were beginning to feel more comfortable, and at noon we finally decided to turn off the motor and just sail. We finally dropped the anchor at 7. 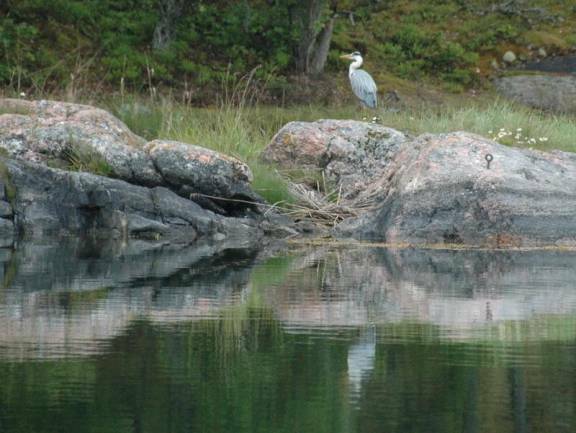 We traveled 75 miles to get to Tjärö harbour in a nature reserve in the Karlskrona Archipelago about 40 miles NE of Simrishamn. 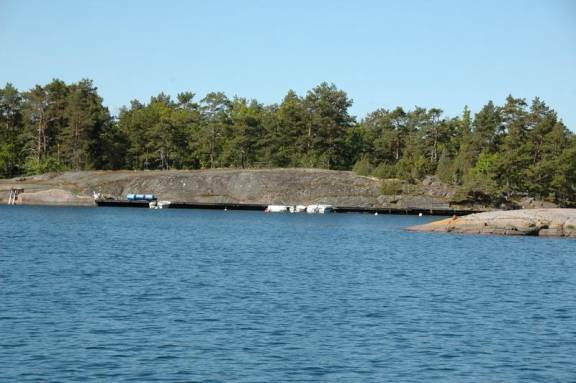 Our second anchorage in the archipelago was just outside a military “no anchor” zone off Flaggskär. Brian suspected the channel is used for military craft and the bay we were in is used for maneuvering. We doubted we would see any activity but imagined seeing a clandestine periscope wake heading up a channel. 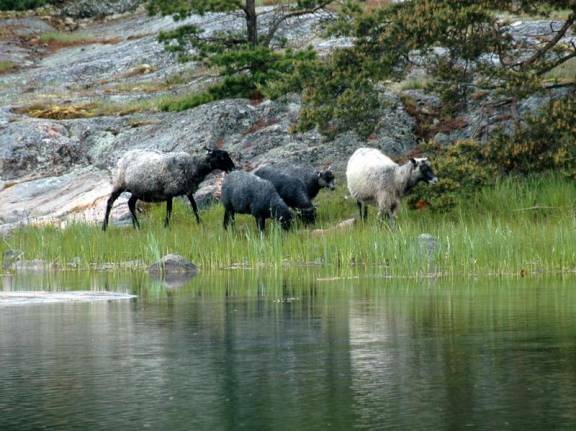 As we left our anchorage we noticed not only sheep and cows grazing on the rocky islands, but also a sign that pictured a submarine with a line through it (“no submarines”). We motored north of the anchorage to a very narrow, shallow channel (short cut to Öland rather than go around Utklippan). The wind was good and we managed to sail through the channel dodging the local ferry that stopped at every little dock. 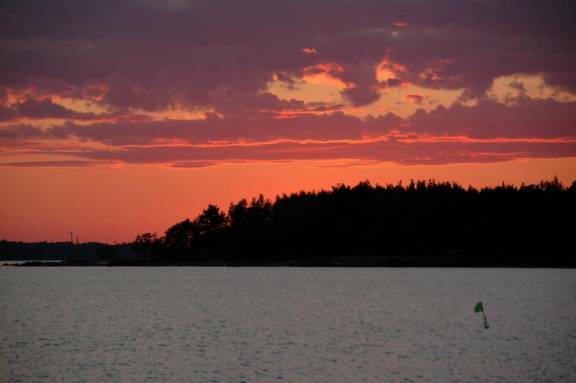 We decided to sail between the long, cigar-shaped island, Öland, and the Swedish mainland on our way north. Since there are no anchorages, we stayed to two marinas, Grönhögen on the SW tip, and Borgholm, the capital of Öland midway up the island. Öland is a cyclist’s heaven. Flat with great farms, flowers, and beaches. The island has plains of limestone with a thin layer of soil, not suitable for farming, but great pastureland, called Alvars. 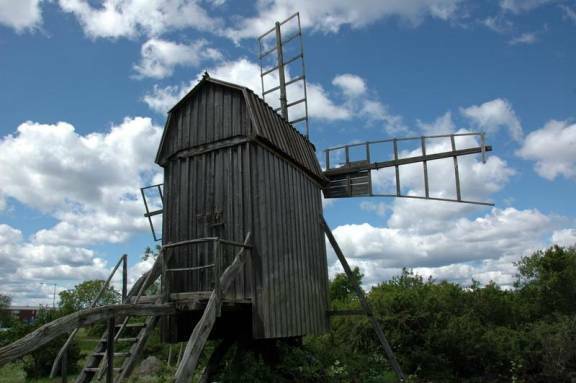 Öland has the largest Avlars, but there are some fields on the mainland, Gotland and Estonian islands. The flora and fauna on these plains are quite distinct. 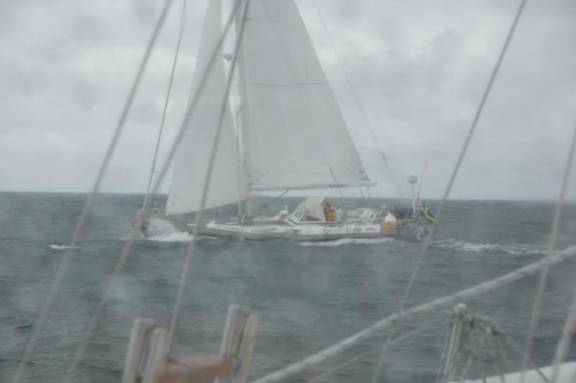 We departed Grönhögen in light winds with the main and iron Genny (motor) providing the forward motion against 10-15 knot winds on the nose. 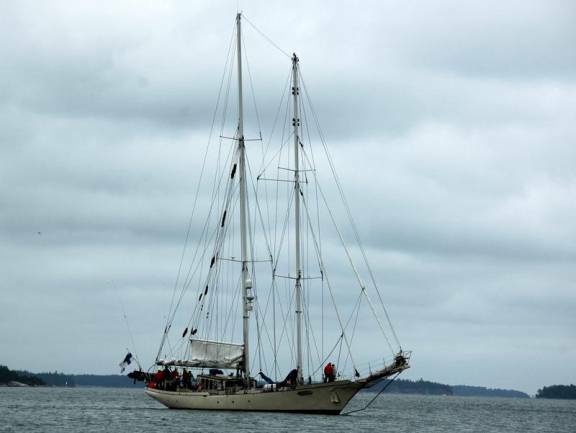 We motor sailed that way for several hours until we cleared the narrow rock infested channel north of Kalmar and were able to hoist the staysail. At last the chance to sail … mind you against 15-20 knot headwinds. As conditions were a bit rough Brian decided that a safe lunch would be eggs (sunny side up) and baked beans in a bowl. Hard to spill. Lots of protein and with the right hot sauce even edible. During one of our more bouncy tacks Jane landed on her bowl and has therefore created a new culinary term … “eggs over hard”. We leave it to your imagination as to what the cockpit looked like. The joy was not to last for long as 2 freighters heading northwards further reduced the space we had for tacking. Short tacking between a couple of freighters and a rock pile is great for perfecting tacking technique. The last hour was spent in 10-foot seas and hard on the18-20 knot winds. Borgholm was in sight. Sails down, fenders and lines rigged, we headed into the port and clam seas. The military seems to know when they can liven up an interesting situation. No sooner had we cleared the entry markers than a frigate (we had mistaken for a ferry) decided to exit the harbour. We stopped, they stopped … we were being blow down on rocks so had to motor forward. They remained on station until we passed then they motored back to their dock (we’re in trouble now). The rain, did we mention the rain, started in earnest as Jane brought the boat alongside a dock equipped for bow tie-ups with stern anchors. The harbour was less than half full so the fact we are taking up 6 spaces was not an issue. The frigate kept docking and undocking as if they weren’t sure they wanted to venture out into a near gale winds or whether they wanted to come over and yell at us. One can only hope they were training helmspersons. 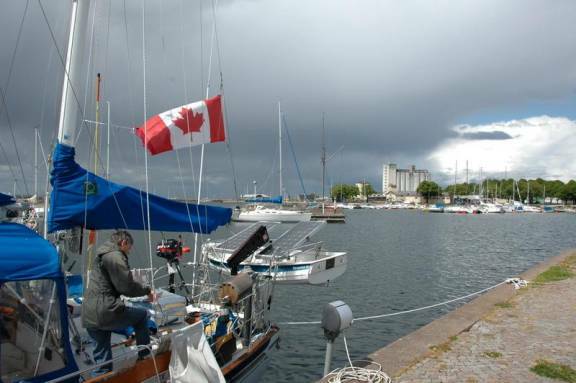 The rain and gale force winds continued, keeping us in Borgholm for 3 nights. 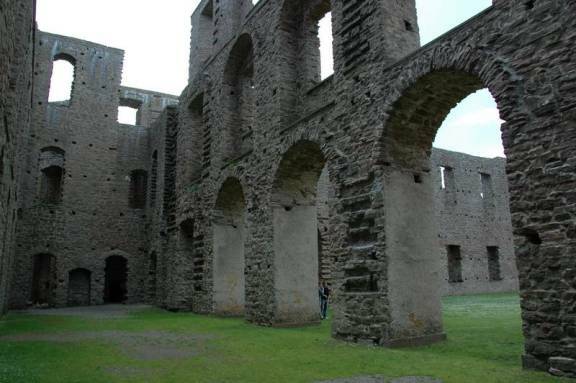 We walked through the town, visiting some of the shops, found two old windmills with a design unique in Öland, hiked in the nature reserve, and visited the Borgholm Castle ruins. It was a castle the Swedes were not able to hold, and was captured time and again by the Danes and Germans…another celebrated Swedish failure. 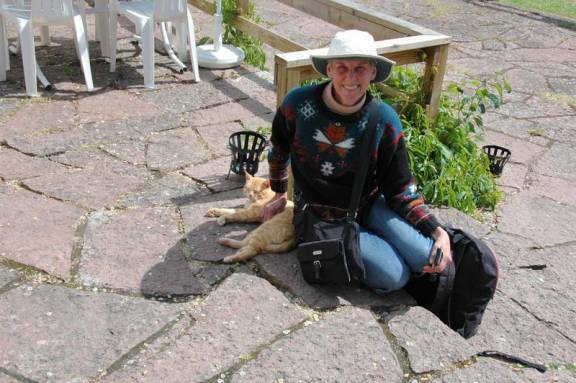 We made friends with the castle cat. She is quite a little hunter. The ruins are nesting sites for hooded crows, and there were remains several fledglings that were not able to defend themselves against the cat. The weather improved enough for us to leave Borgholm, but we still had NW winds and rain squalls carrying winds of 20+ knots. After 30 miles of tough motor sailing our reward was being back in another archipelago with anchorages. 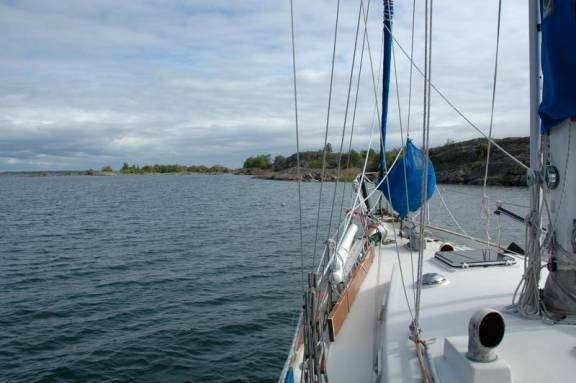 Kiddeholmen anchorage (just outside Oskarshamn) was our first anchorage in the Blå Kusten. We could hear the surf on the windward side of the anchorage, but felt quite safe and secure with barely enough wind to keep the wind generator working. The next day we sailed offshore northwards to the island Spårö near Västervik. The anchorage, Katsholmen, is popular and in a deep bay nestled under a hill with the Spårö båk (unlit navigation aid tower) watching over us. To get to the anchorage we sailed down a narrow channel with rock cliffs on either side. 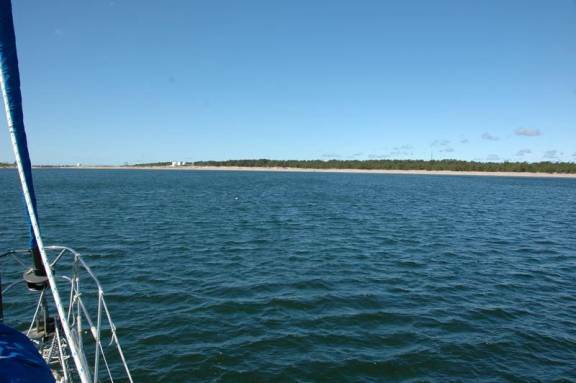 Offshore, out in the Baltic, it was quite remarkable sailing in what appeared to be open waters, and finding 9-foot deep “islands” suddenly jutting up almost to the surface. 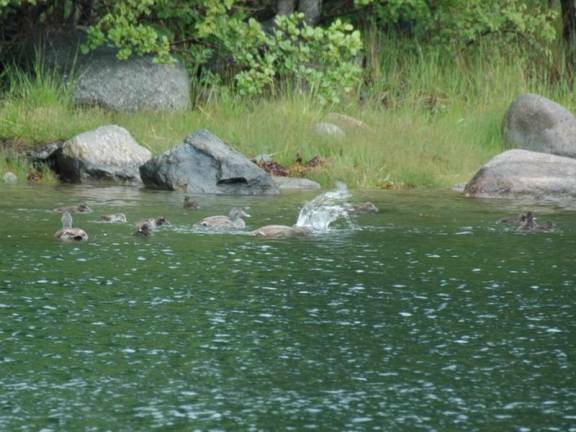 In one area, we thought we saw large white geodesic domes that appeared and then disappeared; they were waves hitting rocks just below the surface of the water several miles from shore. Unfortunately, they were impossible to photograph. We are glad to have a chart plotter at the helm to keep us abreast of the dangers that lurk below the surface of the water. Great sailing weather did not persist. The next day the wind backed to the northeast, so the sailing was more of a challenge. We motor-sailed east to clear the shoals, and then sailed north with our two headsails and main as tight to the wind as possible for 15 miles. We anchored in Bokö Hamnvik on Stora Ålö, near Valdemarsvik. As we came into the bay we noticed a large barge with logs, and there is further evidence of logging operations in this area. A bad sailing day was followed by a lovely sail with jib and mizzen on the “inside” through buoyed channels with many islands and rocks. A couple of times the wind died behind an island and we coasted/ ghosted past buoys. Despite the drizzle most of the day, it was delightful to have no waves and no more than 12 knots of wind on the beam. We anchored at Lånjö close to Slätbaken, the entrance fjord to Mem, the eastern end of the Göta Canal. We almost felt like we were in familiar waters, since we had entered the Göta Canal from the east last September. With barely a whisper of wind, we motored over the open, rolly Baltic past Oxelösund to Västerfjärden on the island Ringsön. The entrance is through a very narrow unmarked channel with rocks on either side. The bay is spacious, but only 12 feet deep … perfect for any kind of weather. 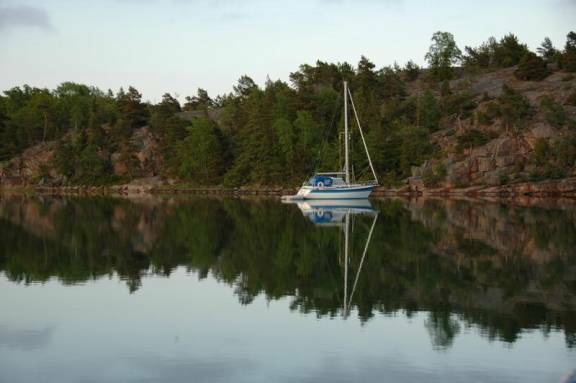 This was our last harbour south of the Stockholm Archipelago, where we had sailed last August. It is June 10, and we really do not mind the cool air in Sweden in June, but when the sun is behind an overcast sky all day, and there is rain, mist and fog, it is plain old COLD. We are in long underwear, wool sweaters, hats and mittens. We motored through the small boat channel north of Öja to avoid going south of Landsort and at one point turned on the Radar because visibility got very poor. We finally had a lazy sail with the Genoa and Mizzen (becoming a favorite sail in lieu of the main) in 6-8 knots of wind. 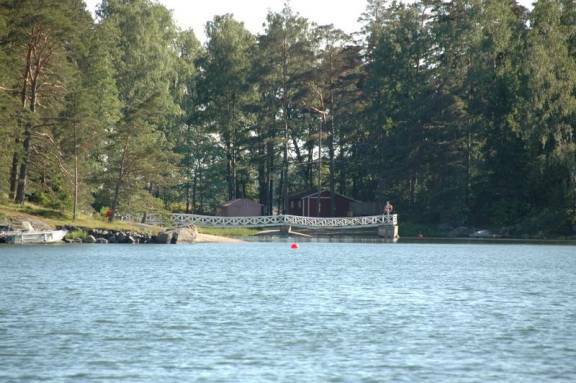 Our first anchorage was in Rånöhamn on the NW side of the island Rånö. We anchored here last summer in August. The island is supposed to have old Russian oven ruins, but we could not find them last year and did not go ashore this year. Our second harbour was Grönskärsfladen, another repeat from last August when it sheltered us from a storm. We finally had a day with sun and good sailing all day. The wind finally veered south, and we sailed northeast with mizzen and Genoa on a broadreach or run all the way. The good weather did not last long. We spent two nights in Grönskärsfladen as near gale warnings were back in the weather forecast, and the rain came back with a vengeance. Our last Swedish anchorage was on Björkö near Sandhamn. We had to motor since there was hardly any wind. We passed the Royal Swedish Yacht Club (KSSS) and saw lots of people in blazers and white pants. The forecast was for winds to increase overnight from the NW to 20+ knots. The direction was good for crossing the North Baltic to Finland, the force was a bit more than we would like, but the wind was supposed to lighten the following afternoon. 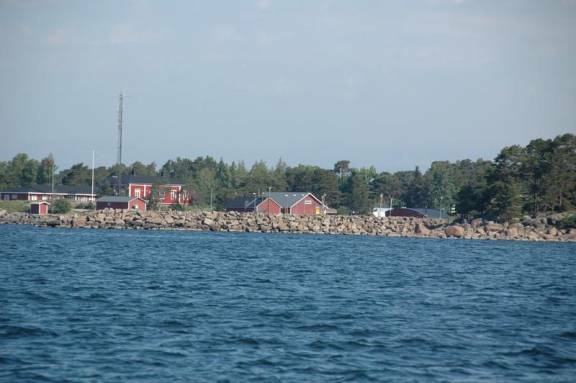 We were the only boat in the Björkö anchorage, even though it was close to Sandhamn and the summer season had begun. Mid afternoon with a steady drizzle, a ferry arrived and unloaded about 50 young men (not in rain gear!) who seemed to be part of some initiation, like a fraternity or Engineering club. They stood in the rain for almost 2 hours. Then the ferry returned to take them home. Crazy humans. On the other hand, we had a delightful time watching the Eider duck elders teaching the young ones how to dive. The little ones had a great time once they got the hang of diving. The next morning we were deluged by rain and had 15 knots of wind in the protected anchorage in the Stockholm Archipelago. We decided to wait to see if the rain and wind abated somewhat. At noon the rain stopped and the wind was down to 8-10 knots, so we decided to haul anchor and leave. Once out of the anchorage we found the wind was 22-25 knots from the northwest. Since our course to Finland was mainly east, we decided to use the wind power and conserve diesel fuel. It was a good decision, but WHAT A RIDE. The wind was not the issue. The waves were amazing. 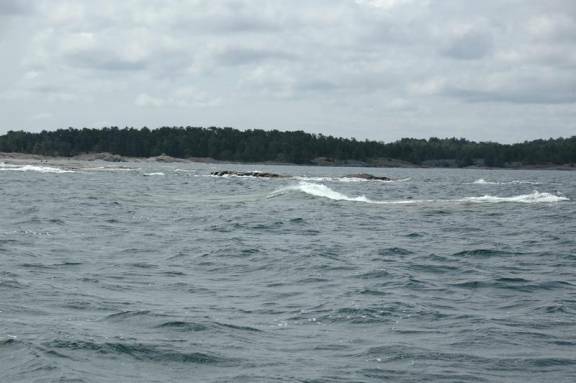 They slowly built as we left the Swedish coast, but when we were about 1/ 3 of our way to Hanko, the waves from the NW met equally large waves from the SE, creating a most interesting and challenging wave train. The wind shifted from NW to W and eventually to SW, and finally the SW waves prevailed. We estimate the largest waves were 15 feet, and we were trying to take them slightly off dead astern, so as not to be caught side wards in such a deep wave trough. On some of them it felt like a roller coaster ride, and the breath was sucked right out of us. The boat, as usual, handled it all within stride. 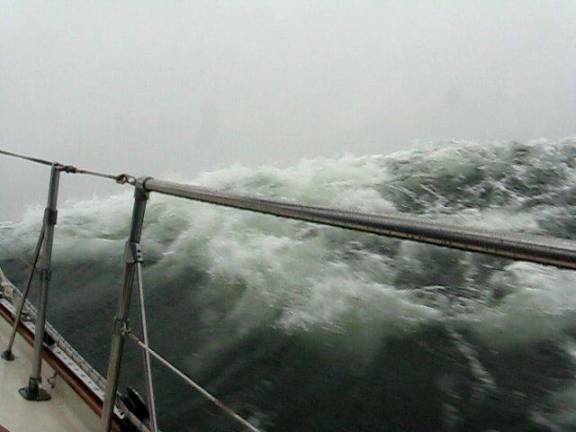 At one point we were sailing with our triple-reefed mainsail, surfing at 9 knots. It was an exhilarating, somewhat exhausting 24 hours. 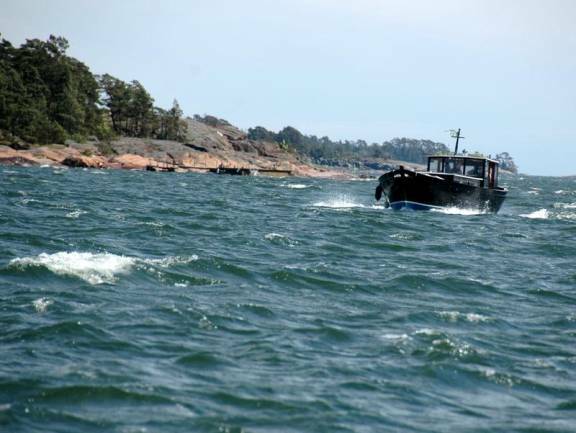 Our original plan was to go north into the Turku Archipelago and go to an anchorage west of Hanko that we were in last summer. 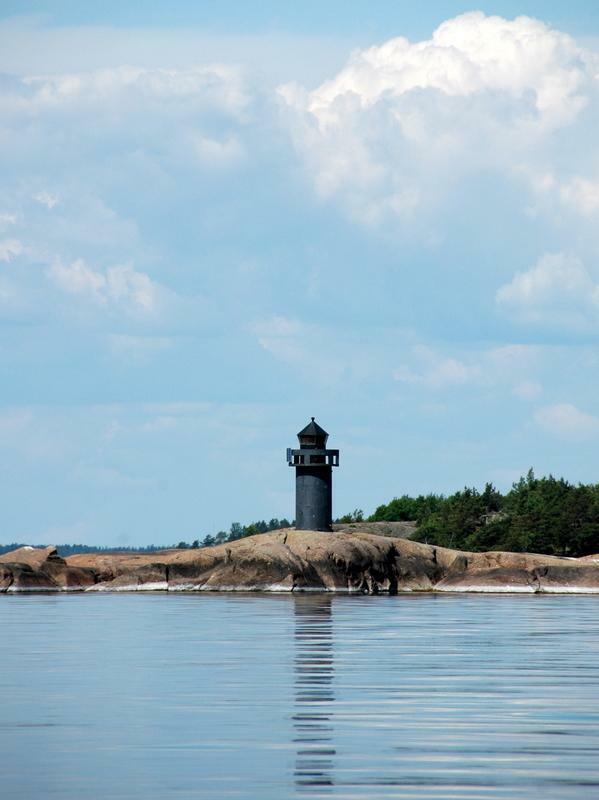 When we reached the decision point of going north into the archipelago (with hard to see buoys, unlit) at midnight, the decision to stay in the Northern Baltic and go directly to Hanko was a no-brainer. We dodged about 15 cruise and cargo ships, used our AIS and radar systems extensively to determine where the big boats were heading (we assume they never saw us). We got to Hanko at noon local time and found a sheltered bay where we could lower the sails, and decided to anchor there in a harbour of refuge rather than venture into the marina and try to dock in close quarters. We anchored near a Finnish military base. They sent out a boat to investigate the foreign-flagged boat anchored near their target practice area, and figured we were OK. We heard them target practice (or was it a 21-gun salute for the Canadian boat, eh!). 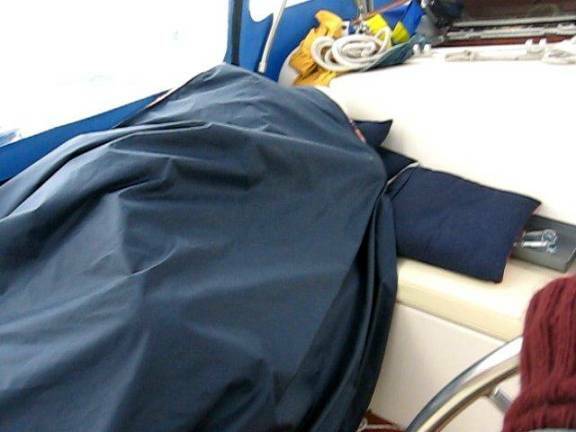 Fatigue overtook us, and after we deployed our two anchors and were convinced the 24-knot winds were not going to send us on the beach, we took a much-needed nap. We woke to a telephone call announcing the birth of Jane’s grandson, Gavin William Spraker in New York City. The major loss during the North Baltic crossing was the fish-cleaning table Brian designed and built to be used on the aft deck. 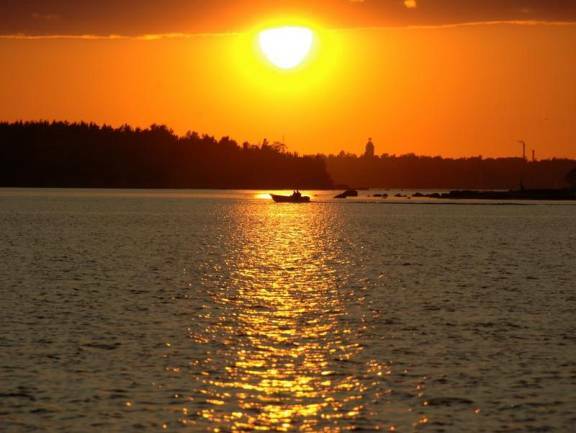 Since we are not catching any fish in the Baltic, we are not missing it yet. 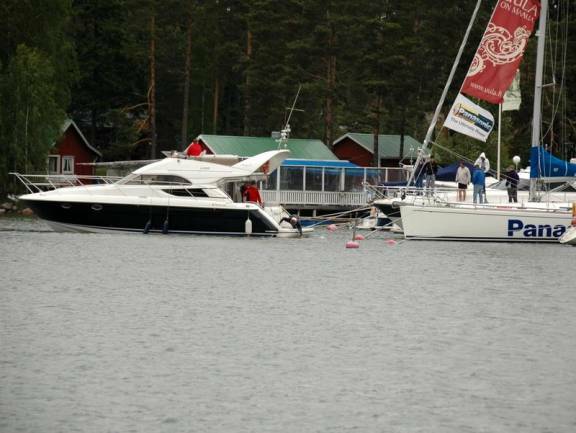 The wind finally died down and we moved to the marina in Hanko for much welcomed showers and sauna. We spent two hectic days seeing doctors (Brian had an infection that needed medical attention), buying provisions and charts, and doing basic maintenance on the boat. 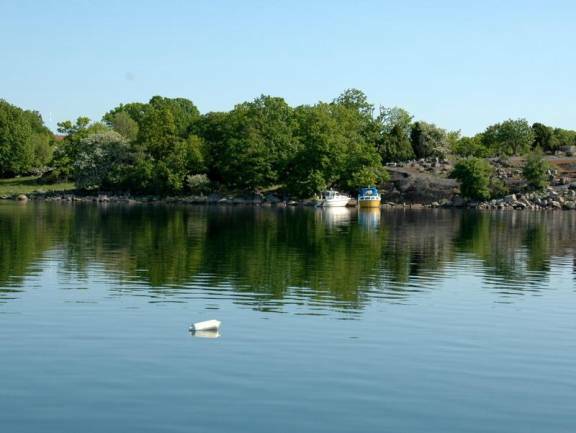 On June 18 we celebrated Brian’s birthday by sailing 16 miles east to the anchorage at Rödjan on the south side of the island Älgö. We were in this harbour last July, and it is a beautiful nature reserve. The next day we had a gentle sail with mizzen and Genoa to get to an anchorage 15 miles further east (crow-flying distance), but took us 36 miles through channels, around rocks and islands. Even though there was a high wind warning, but sheltered small craft route gave us an easy sail. We anchored at Osterviken near Jakob Ramsjö, a guest harbour near the city Ingå. The marina has a restaurant with a live band for Mid-Summer celebrations. We heard a wide selection of music, from current Finnish pop-rock to 1950’s Elvis to mid-60’s rock. All rather poorly done. We keep trying to get them to do some Leonard Cohen or Moxie Frugus (Canadian music…for the non-Canadians), but so far the have not heard our request. There was a 100-foot schooner (training ship?) anchored off our stern, enjoying the local festivities. 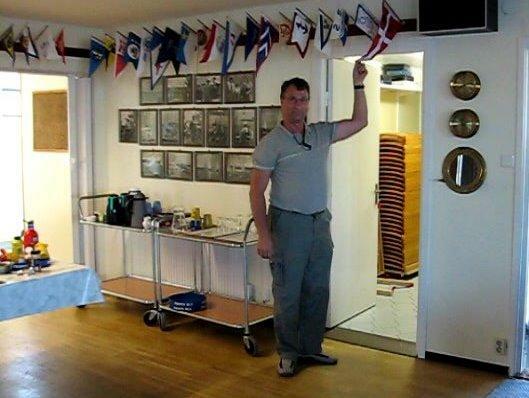 We recall that it was just a year ago that we landed (unceremoniously) in Helsinki sinking our CQR anchor in a SAAB parked too close to the edge of the dock. Another day dawned with wind at our back. We MUST remember that these days happen. We sailed with Mizzen and Genoa since we were on dead runs most of the time, and actually PASSED a small powerboat and another sailboat surfing down waves at 8+ knots in 20+ knots of wind! We were almost at the limit of downwind rudder control, during our very swift passage. We anchored at Bockfjärden, the harbour we spent several days in last July after our transmission was working, our first out of Helsinki. We saw a deer on shore munching on flowers in one of the cottage gardens. The sky was dramatic with strong sunlight and also deep dark clouds; luckily we were spared rain. There is something in these waters called “sailor’s twilight” which is the time after sundown, but when there is still lightness in the sky. This happens throughout the night in late June. 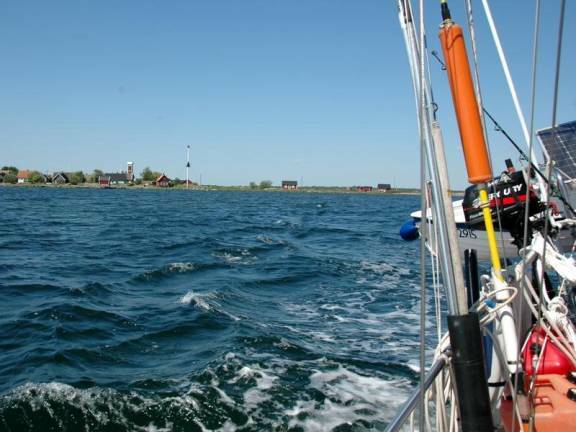 The next day we sailed south of Helsinki, identifying many landmarks even though we were far from the harbours. We still had SSW winds up to 15 knots, so continued sailing with our mizzen and Genoa with good results. Early morning fog cleared up mid-morning. We anchored in the bay on the NE side of Villinki island, east of Helsinki. There are a number of cottages, but the south island has signs indicating that the land is military. There is a large radar station and what looks like a mobile phone tower. This was the beginning of radar stations at regular intervals along the coast. The white, squat almost cute looking sector lighthouses in the archipelago have given way to tall, black towers that have a menacing look. We began to hear more Russian on the VHF radio. The island is owned by the military and has a number of large well-kept “cottages” in among the military buildings; it may be a vacation spot for the brass. The high-pressure area finally arrived over Scandinavia bringing us warm sunny weather and no wind. 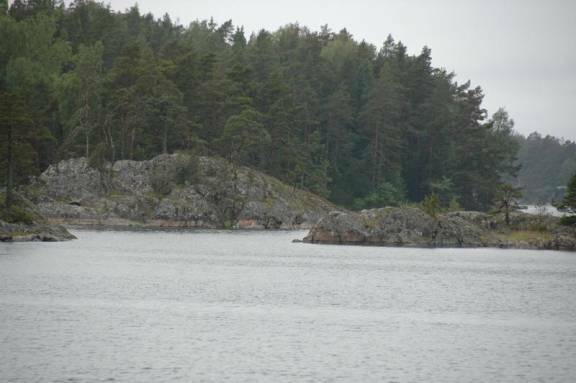 With absolutely no wind we motored to Norra Sandön, a recreation area that has an outhouse on shore, firewood, a BBQ area, and buoys for boats that want to tie stern to buoy and bow to an eyebolt hammered into the rocks. It was finally warm enough for us to launch the dinghy and go ashore. We saw families of birds with their young: gossamers, barnacle geese and swans. Beach peas (like we saw on the shores of Lake Superior), wild chives, heather, moss, lichen, wild pansies and daisies and beach grass were in bloom. 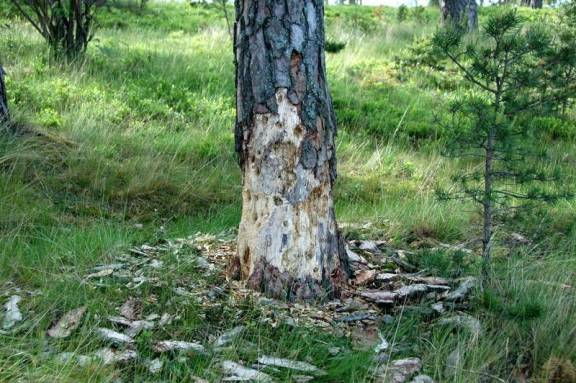 We saw one cedar tree that looked like it had been attacked by a deer. There is just one other sailboat tied to the shore: a couple with 4 boys on a 30+-foot boat. The portholes and hatches are open for the first time this year, and we are trying to find T-shirts and shorts. Family returning from fishing on the other side of the island. With the dinghy in the water, we had the opportunity to scrub the black oil off the waterline (mainly from Copenhagen, we think) and clean up the topsides where a small powerboat went out of control and left some of its plastic rubrail on our topsides. 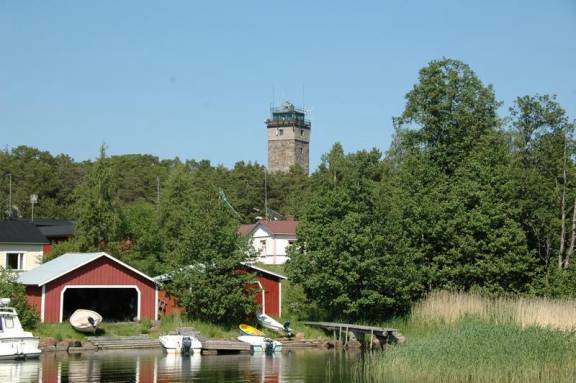 Another windless motoring day brought us to Kaunissaari, and island with a town on the southern tip. 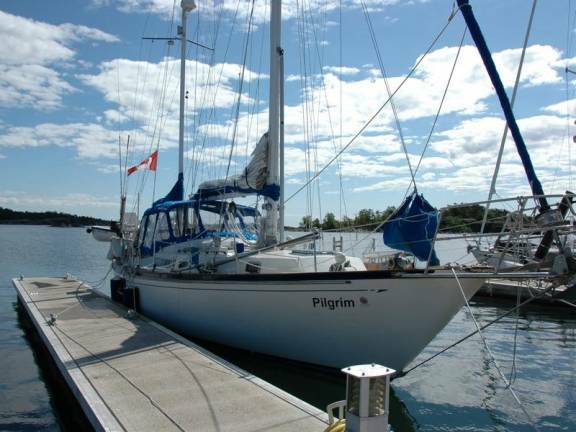 The guest harbour was full of boats and rather small for Pilgrim, so we anchored in a bay east of the harbour. We took the dinghy into the village and spent a hour walking around. We saw the museum, bought some lettuce and asked about the whereabouts of a bank machine (the young lad in the store did understood a bit of English but could not converse except in Finn). There was no ATM, but he was willing to give us a cash advance on our Visa card (which we declined). The anchorage at Kaunissaari, a very nice spot that doesn’t seem to be used by boats. 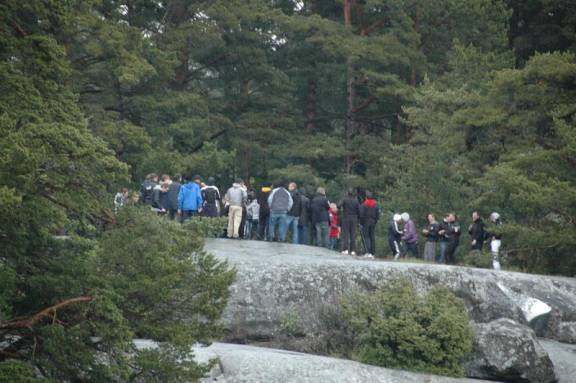 They would rather crowd into a small harbour that is 100 metres from this spot. Two young children spent several hours paddling a sea-kayak around our boat, having a great time. Ferries arrived and left the tiny harbour. Pleasure craft kept arriving; we wondered where they were mooring since all the spaces in the marina seemed taken. We had 5 days before our Russian visa became valid. 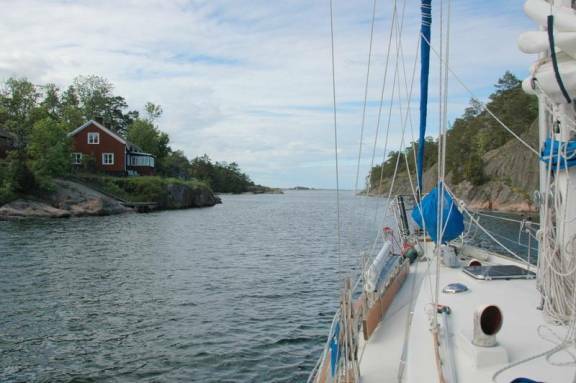 We found an anchorage north of Kirkonmaa, east of Lehmäsaari, an island with another recreation harbour that is too shallow for us. 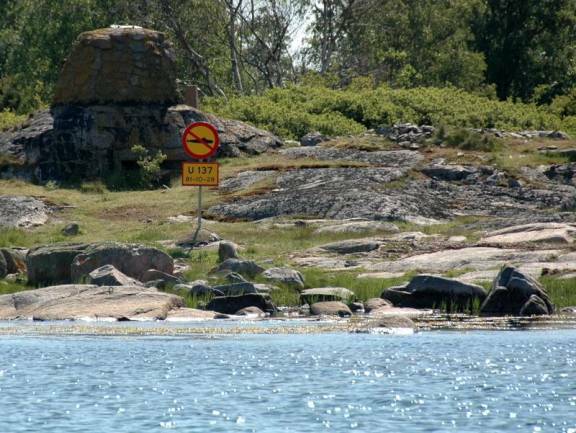 There is a military restricted area just north of Kirkonmaa, and we anchored just outside of it. As the wind shifted from SW to east, our anchor rode got snagged on the bottom. We imagined mines, and were relieved the obstruction was just rocks. We had plenty of boat chores to tackle, and enjoyed being ahead of schedule for a change. 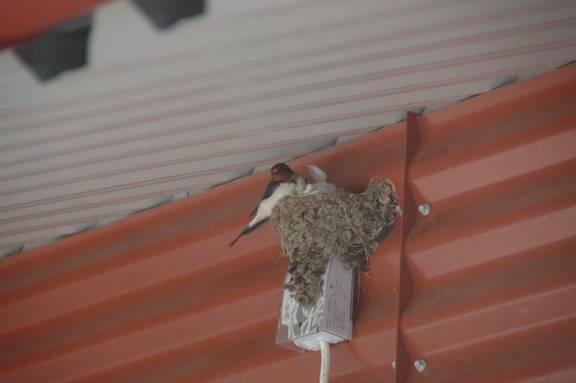 The small boat harbour on Haapisaari is too narrow and shallow for Pilgrim, so we docked near the Passport Control / Ferry dock and bothered a little barn swallow that had built its nest right where we docked. We enjoyed a lone Black-necked Grebe and the Barnacle Geese families. We also watched as summer residents on the island brought their junk to a pier. 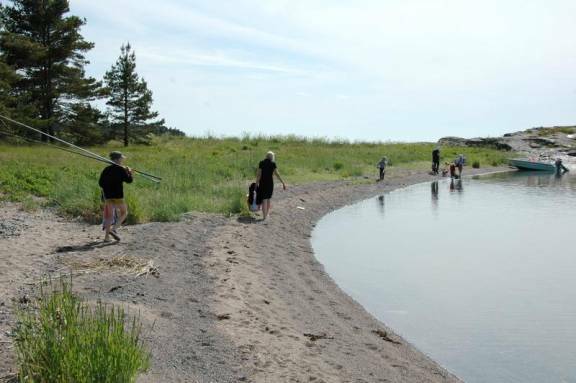 It seemed to be “clean-up week” on Haapisaari, and the junk pier had all sorts of building equipment, swing sets, BBQs, etc. that had seen better days. 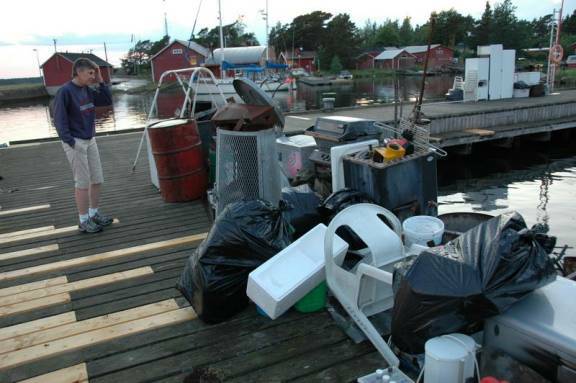 It reminded us of the dump on Green Turtle Cay in the Bahamas, but on a much smaller scale. 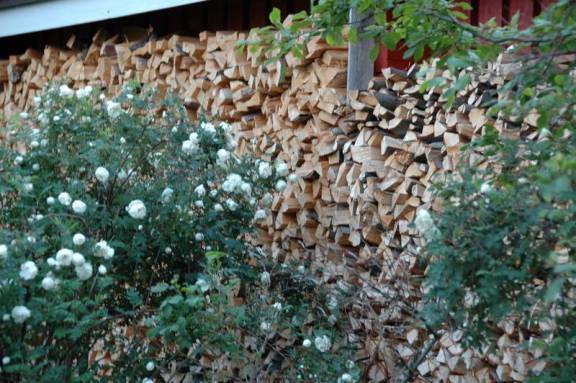 Every camp on the island had a large woodpile for the wood-burning saunas. The settlement on the island is primarily for summer residents. 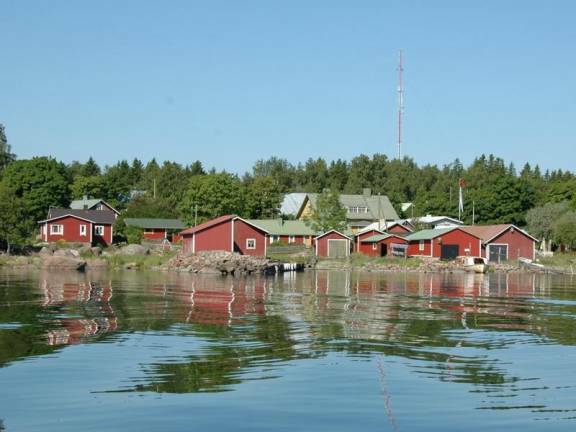 It used to be a township in its own right, but now is part of the city Kotka on the mainland, and even receives its fresh water supply from a pipeline from the mainland. Our last look at Finland for the foreseeable future.